In a sea of rather unremarkable 110cc commuters, does the Radeon do enough to stand out? An aspirational 110cc commuter bike? Sounds strange right? TVS has tried exactly that with the Radeon 110. It gets a lot of chrome trims and add-ons with a hint of nostalgia (cough* Splendor *cough). Despite the new look, underneath it has tried and tested underpinnings. TVS already has two 110cc commuters: the Star City plus and Victor. So where does the Radeon fit exactly? Also, has TVS trained its eyes on the Hero Splendor with this? Currently, TVS sells just one variant of the Radeon and that's the one we are riding today. It looks like a Splendor. There are no two ways around that. In fact, the Radeon looks like a premium variant of the Splendor and that's what got a lot of fellow road users excited when they first saw the bike. The headlamp design is new and has an LED DRL strip neatly integrated into the lens. Primary lighting is via a halogen bulb that does a good job of lighting the road. The tail lamp and turn indicators use a bulb type setup as well. The fuel tank gets rubber thigh pads that do make the 10-litre fuel tank appear larger. The seat gets a brown cover that nicely contrasts with the white colour our test bike came with. Other colour options are Metal Black, Golden Beige and Royal Purple. To offer some more contrast, the motor crankcase features a nice golden shade. You get copious amounts of chrome in places like the headlamp bezel, crash guard, the large exhaust muffler cover and rear rack that also has a small plastic plate integrated into it. 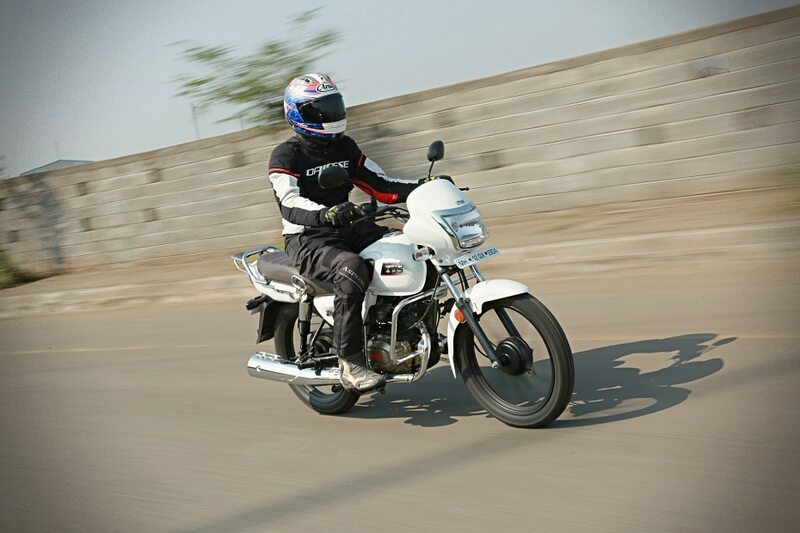 Fit and finish are quite good and overall, the bike feels sturdy enough to tackle the rural hinterlands of India. The Radeon is a very accessible motorcycle, thanks to its 780mm seat height which TVS claims is the lowest in class. It seems that way as at my 5ft 6in colleague, whilst seated on the bike was able to easily place both feet on the ground. Seat length is 730mm and width at its widest point is 280mm. TVS claims both are the highest in class. The seat does feel comfortable in extended city commutes and highway runs. It is only after you cover more than 50km that you notice a slight discomfort. This is due to the seat’s inherent soft nature, despite being well padded. That said, the seat is slightly contoured as well and there is a lot of room to move around. The pillion seat is wide as well and feels quite comfortable, despite the thicker padding. You also have a lot of space to move around, given the generous length of the seat. Pillion seating position is neutral and the rear grab handle is easy enough to grip. True to commuter tradition, the Radeon also features a small grab handle mounted above the right rear shock for pillions sitting side-saddle. And it doubles up as a luggage hook as well. The riding position could feel a bit cramped for taller riders given the fact that the handlebar is placed closer to the seat. However, it is comfortable for average to shorter riders. Given its slightly forward-set placement, footpeg positioning feels comfortable as well. The upright riding position is easy to manage and allows you to get around swiftly in traffic. Switchgear quality is fantastic and feels built to last. You have a headlamp switch on the right side of the handlebar with the DRL light always on. The soft rubber on the palm grips feel premium and even with the gloves off, feel comfortable to hold. Both rearview mirrors offer good visibility, despite being placed closer to the rider. We reckon though, that they could perform even better with longer stalks. The Radeon’s instrument consists of twin square pods with a strip in the middle that houses four telltale lights - neutral, high beam and two turn indicator lamps. The pod on the left has the speedometer, mechanical odometer and power/eco indicator, while the one on the right has the fuel level indicator, a side-stand indicator and weirdly, a dummy space for another light. Interestingly, the side-stand indicator is accompanied with an alarm that beeps if the side stand is still down when you switch the indicator on. You also get a USB charger that is positioned rather awkwardly behind the headlamp cover. Given its positioning, charging anything on the go feels unsafe as the charging cable can get entangled with the handlebar. The Radeon’s 110cc Duralife motor is shared with the Star City plus. Both motors carry the same bore and stroke values and performance figures. The Radeon’s motor, though, gets a new airbox and exhaust and has a slightly higher compression ratio. This 109.7cc air-cooled single makes 8.4PS at 7000rpm and 8.7Nm of torque at 5000rpm. It is tuned for a flatter torque curve with better low-end grunt. The motor feels peppy at low revs and helps the Radeon pick up speed in haste, helping it clock 0-60kmph in 7.88 seconds. After this, the performance seems to taper off a bit. It shows in the roll-on times as well. It does the 30-70kmph run in 3rd in 10.92 seconds. 40-80kmph in 4th is even slower at 14.51 seconds. Top speed stands at a V-box tested 92.44kmph. The four-speed gearbox has evenly spaced gear ratios and does a good job of keeping the motor in the powerband. It has an all down shift pattern with shifts slotting easily and with a fair amount of precision, accompanied by a pleasant “click”. This torquey nature of the motor also allows it to run more relaxed at city speeds below 50kmph, and help it achieve a tested fuel efficiency of 66.29kmpl. Out on the open roads, at speeds close to 60kmph, the engine is a bit beyond its comfort zone and that shows in its highway fuel efficiency number of 63.97kmpl. That said, the motor does not feel strained until the 70kmph mark after which it takes on a gruff note. Generally speaking, refinement levels are quite good. Vibrations are well contained with just a hint felt through the footpegs and fuel tank between speeds of 50 to 60kmph in fourth gear. The motor is a gem and makes the Radeon a nippy city runabout. The Radeon is built around a single downtube cradle frame. It gets conventional front forks and twin rear shock absorbers that can be adjusted for preload. Kerb weight at 112kg is 2kg more than the Splendor iSmart. Interestingly, it gets larger 18-inch alloy wheels (Star City plus gets 17-inch alloys) that should allow the bike to perform better on rural roads. The alloy wheels come shod with higher profile tubeless TVS tyres. Despite the suspension feeling tuned a tad towards the stiffer side, ride quality is quite good. While we won't term it as plush, it soaks up bumps and undulations without transferring judders to the rider or pillion. Even with a pillion on board, the rear suspension rarely bottoms out. Pillion comfort is quite good as well, as instead of bobbing around, you feel like you are almost sailing over a rough patch of road. Surprisingly, unlike the Star City plus or the Victor, having a pillion on board does not make the Radeon’s front end feel flighty. Instead, it remains light, yet planted. Dial in the fact that you sit closer to the handlebar, and hustling the Radeon in narrow gaps in traffic is a breeze. The only chink in the armour are the tyres. They perform decently on good road surfaces, but over gravel, the tyres feel skittish. Another issue we had was with braking. You get 130mm front and 110mm rear drum brakes. A front disc brake isn't available even as an option. The drums miss out on strong bite and that reflects in braking distance as well. The Radeon goes from 60kmph to a standstill in 23.74 metres, which is a shade more than the Splendor iSmart. A front disc brake could have resulted in better times and more surefooted braking. It gets TVS' SYNC combined braking system which should help if you are a novice rider, but it does not have any effect on braking distances. TVS has priced the Radeon at Rs 48,990 (ex-showroom Delhi). At this price, it undercuts the Hero Splendor iSmart’s Rs 55,650 asking price by Rs 6,660. The Radeon does miss out on features like an analogue digital instrument cluster and start/stop system that the Splendor comes with. In its place, it offers a more robust and contemporary design with a sorted suspension package and a refined and fuel-efficient engine. The Radeon 110 is built to appeal the younger generation from B-towns who need a dose of style, premiumness and ruggedness at an affordable price. Thats where the Radeon slots in. And the fact that it looks more like the Splendor than the Splendor iSmart does works in the Radeon's favour - it will help the Radeon connect better with the younger generation residing in semi-urban or rural India. The Radeon impresses quite a bit. We just wish for better brakes.